John Sheridan thanked everyone at Fleetwood Town for their support as his spell in charge ended on a winning note. 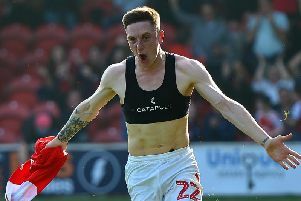 Town ended what has been a difficult season with a 2-0 win against Walsall at Highbury thanks to first-half goals from Ash Hunter and Paddy Madden. It meant they finished 14th in the League One table, a vast improvement on where they were when Sheridan arrived at the club in February. As a result, Saturday’s match felt more like a pre-season game combined with a farewell party for Sheridan, who now makes way for the incoming boss, Joey Barton. However, it did end with a hospital visit for Bobby Grant, who sustained a gash to the head after an aerial collision with Jack Fitzwater in the 39th minute. He was subsequently brought off but still watched the game and chatted with supporters before heading to hospital. Sheridan said: “He’s got a bad gash above his eye, he had to go to hospital. “I think he’s going to need a bit of plastic surgery, I mean he needs that anyway! The goals from Hunter and Madden meant Sheridan could say goodbye to Highbury with another three points. When he took over from Uwe Rosler in February, Fleetwood were on an eight-match losing run. However, he more than steadied the ship and can leave with his head held high as Barton prepares to replace him next month. Sheridan said: “I’m chuffed to bits to finish with a win. “It is important, especially at home, last game of the season. “It is a nice way to finish. “It has not been a good season, let’s not get carried away, but since I have come in the players have responeded. “The aim was to stay in the division and we have performed and done well. “I’d like to thank everyone who has made me feel very welcome in the short time I’ve been here. One of the main beneficiaries of Sheridan’s time at Highbury has been Hunter, who repaid him in style on Saturday. He opened the scoring with a curling effort, though the departing manager was quick to reiterate Hunter meant his attempt as a shot instead of a cross. He said: “I’m sure he did mean it because he has scored three of those since I have been here! “For the size of him he does not half hit a ball! “It was a good little passage of play and he made it look simple.